How Is a Golf Handicap Figured? The USGA's handicap rules help golfers of varying skill levels enjoy playing together. The United States Golf Association (USGA) uses a handicap system to adjust scores so golfers of different ability levels can compete against each other in a fair manner. In 1987, the system was changed from a raw number that was applied universally to an index that can be modified to suit an individual golf course. Each USGA-sanctioned golf course should have a chart on display that shows the number of strokes to reduce or add to a player's score based on his handicap. A golfer must record a minimum of five 18-hole scores on USGA-licensed golf courses to become eligible for a handicap. As many as 20 scores may be included for consideration, but only the lowest scores of those 20 will be used in the final calculation. This prevents the golfer from playing several rounds poorly to hide his true skill, commonly known as "sandbagging." Every USGA-sanctioned golf course is given a course rating and a slope rating. These numbers are usually listed on the scorecards, but you can also call the pro shop or look up the golf course online to find its ratings. The course rating is the score that a scratch golfer would be expected to post at that course. The slope rating measures the relative difficulty of the golf course, taking into account features of the course that may be harder to overcome for a novice golfer than they would be for a more skilled golfer. 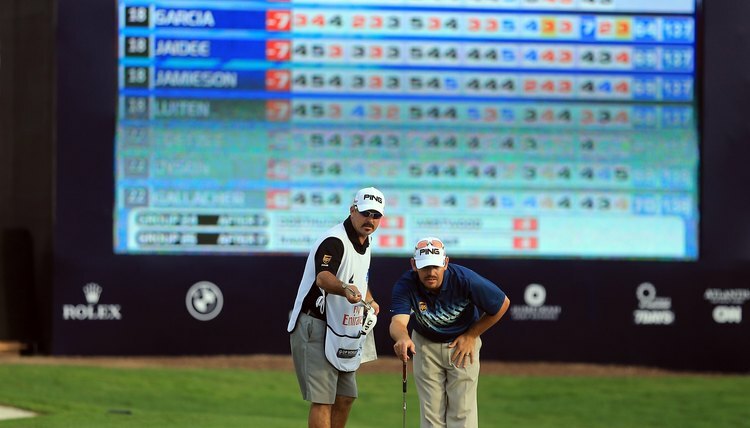 The course ratings are used to adjust the golfer's recorded score to reflect the difficulty of that particular course. First, subtract the course rating from the score and multiply the difference by 113. Divide that result by the slope rating of the golf course to determine that round's handicap differential. List all of your handicap differentials in order from lowest to highest. Use the handicap calculation table listed in the Resources section to look up the number of differentials to include in your calculation. If you have five or six recorded scores available, only the lowest differential may be used. The allowable number of differentials increases as you record more scores. Once you reach the maximum of 20 recorded scores, you must use the average of the lowest 10 handicap differentials for your calculation. Take the average of the lowest differentials up to the maximum number allowed. Multiply this average by 0.96 to find your handicap. The maximum possible handicap for a male golfer is 36.4. Female golfers may have a handicap as high as 40.4. What Is the Average Golf Handicap in America? What Is a Golfer's Handicap?